Clusters of small, sweetly scented, deep pink buds open in January and February and are followed by rounded, purple-black berries. 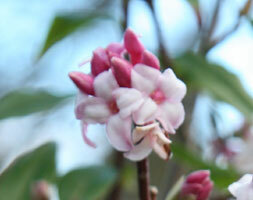 This deciduous or semi-evergreen shrub thrives in a sunny, sheltered position. Try it in a mixed or winter border or next to a path where its fragrance can be appreciated. Strongly upright in habit, it looks wonderful under-planted with a carpet of magenta or white Cyclamen coum. All parts of the plant are toxic if ingested.